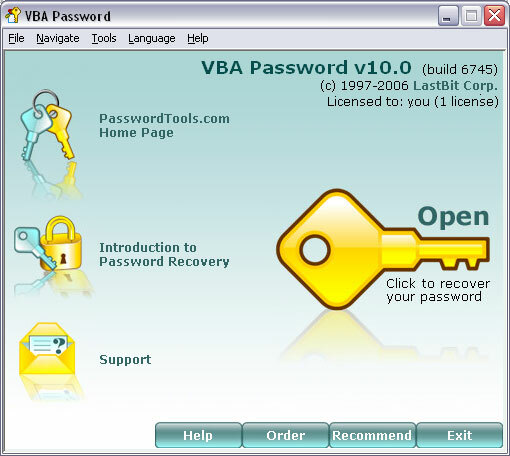 VBA Password is a password recovery tool, which comes in very handy if you forgot, lost, or misplaced your password for VBA (Visual Basic) module in Word or Excel document. Such situation may also occur if someone who does not work with you anymore password protects your vital information that is absolutely necessary to retrieve. Any password could be recovered instantly. Program interface is web-like and easy to use. No professional expertise is required for setting up and using the program; you can recover any document just in few mouse clicks. VBA Password supports all Word and Excel versions. The refreshed and improved recovery engine which is now much more powerful, new design, new documentation and a lot of minor improvements. vba password macro lost password forgotten forgot crack break recover password VBA Password: password recovery for VBA (macro) modules in Word/Excel documents.